- Private Heated Pool *Pool heating is available for this property from October 1st through May 1st for an additional $35/day. 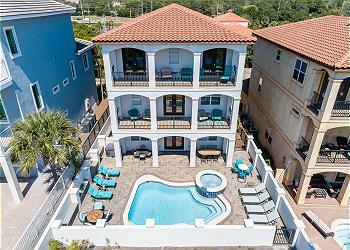 DETAILS: Tucked away in Miramar Beach is a 6-bedroom coastal getaway like no other. “Vitamin Sea” features a private pool, a chef’s kitchen and stunning Gulf views from second-floor and third-floor balconies. A golf cart, outdoor grill, laundry room and easy access to great shopping make this retreat wholly unique. Take your morning coffee out to the balcony and then head down to the beach for a day you’ll never forget. Afterward, hang out poolside with family and friends, and then head back to where your day began for sundowners. The gourmet kitchen features granite countertops, select stainless steel appliances and designer cabinets, making it the perfect setting to visit with friends and family while preparing a meal. The open design has candelabra-like lighting in the dining area with seating for 8, while the kitchen counter offers seating for another 5. A breakfast area has additional seating for 3. The dining area gives onto the living room which features a vast flat-screen television and access to the patio and pool area. The first floor also has a guest bedroom which has a queen bed and shared bath with a shower only. The second floor has a bunk bedroom with three twin-over-twin bunk beds and one twin bed, along with a private bath with a shower/tub combo. Just down the hallway is a guest bedroom with a twin bed and a shared bathroom. Next door is another guest bedroom with a king bed and a private bathroom with shower only. The third floor features the master bedroom which has a king bed, access to the balcony with Gulf views and a private bathroom with a shower and a beautiful soaking tub. Next door is another guest bedroom with a king bed and a shared bathroom. This Miramar getaway comes with 6 bicycles and a golf cart which will whisk you down to the beach and back in a minute or two. An outdoor grill in the pool area makes for a great BBQ venue. Contact 360 Blue to book this 6-bedroom, 4-bath retreat right away. “Vitamin Sea” sleeps 16. First time as new home owner that I got to stay with my children and 4 little grand children. We all enjoyed the house so much. I am so in love with the size of the rooms and huge closets are perfect for spreading out suitcases and more than ample space to walk around the suitcases. The bathrooms were a priority when purchasing to be a good size so that two could easily get ready at the same time. The bathrooms worked out great. We loved the outdoor tv mounted so you could swim and not miss those sports games. Corn hole is fun to play in the green space outback. With 4 under 4 the golf cart is perfect for traveling to the beach but still just a short walk. I am a little biased but I live the home more each time. Hope everyone does too. 360 has been a blessing especially starting out with the wrong rental company a few short months back. Love Kristin and Maggie. Spring break get away with my husband and 3 teenage kids. We had a mishap with the original house we rented but Morgan with 360 blue took care of us and found us another property quickly. She was very prompt with all our needs - Wonderful customer service! The house is absolutely beautiful and had everything we needed. We spent many days out in the private heated pool watching March Madness and the beach is just a short walk from the house! Already planning a trip back next Summer!! We are beyond thrilled that the mishap didn't hinder your vacation at all! This home is so beautiful and we are happy you got to enjoy the pool as well. Morgan is a valuable asset to our team and we appreciate you letting us know! Thank you so much for staying with 360 Blue and we can't wait to start planning your next vacation!